Aunt Virginia, or Auntie Bebs as known by her friends and family, should wear a medal saying she had fought a good fight, finished the race and kept the faith in going to God’s kingdom. She was a good person inside and out and she was not easily affected by negative influences around her. She always kept her temper under remarkable control. She was loving, kind, generous and helpful to strangers, especially new immigrants from the Philippines even if it meant being in danger of eviction from her apartment. Auntie Bebs was born on November 24, 1931 in the Municipality of Concepcion in the province of Tarlac, Philippines to her mother and father Baldomera Castro Manuit and Santiago David Baluyut. She was their six child born among her ten siblings, namely the late Arsenio, Gloria, Consolation, Magdalena, Guillermo, and Augusto, and her surviving siblings Anita, Lucila and Cresencio Baluyut. 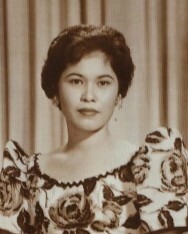 In her younger years, Auntie Bebs lived with her older sister and her husband, the late Gloria and Pedro David. While in high school, she took care of their children Dell and Aurora while they were working. After high school, she studied to be a secretary and had a great social life including becoming the second runner up of MISS MAKATI. Auntie Bebs attended Malayan College and later worked as an accounting clerk at Winthrop Stearns Inc. in Mandaluyong City, Philippines. Like any other girl her age, she had several suitors but it was not clear why she never married but ended up being happily single. Later, we found that Auntie Bebs assumed the role as the BREAD WINNER in her family after her older siblings married. After 16 years of working in the same company, she was petitioned along with her sister Lucila by their mother, Baldomera (who was petitioned by her son, Augusto), who had been living in the U.S. Auntie Bebs and her sister left for California in January 1, 1975 and never went back to the Philippines aside from an occasional vacation. While living in California, she worked at Beckton Dickinson for 22 years before retiring in 1998. In 1967, Auntie Bebs adopted her nephew, Cresencio Yumul who was living in the Philippines. In 1978, Cresencio was petitioned and moved to the US to join Auntie Bebs. Later, Cresencio Yumul (now Cresencio Yumul Baluyut) married Michelle Gasca and had 2 children, Cresencio Baluyut Jr. and Krichelle Baluyut Gallardo. Cresencio predeceased his adopted mother in 2010. Auntie Bebs lived a healthy life, but in 2018, her health began to deteriorate resulting in kidney failure. While her passing pains us, we know life goes on and that this is not a permanent separation. Auntie Bebs, your generosity and kindness will always be remembered and loved and you will be forever in our hearts.